When it comes to shea butter, there are actually two types of shea butter in the market: the refined, and the unrefined shea butter. Below are the difference between both of it. Unrefined shea butter is extracted from the Nuts using hands. This method ensures that the vitamins, minerals and all the awesome properties of shea butter is retained in the butter. The refined shea butter on the other hand is extracted using the chemical processing. During this process the butter usually losses some of it's properties and minerals. Unrefined shea butter is usually perceived to be 'strong smelling' due to its earthy, nutty aroma. Refined shea butter usually doenst have any scent or will have scent as according to the addition of fragrance made by the manufacturer. Refined shea butter is usually white/ creamy, with smooth and fine texture. Unrefined shea butter is usually darker brown, and have grainy texture. Unrefined shea butter is more expensive than the refined due to the processing where it needs work force to extract it as opposed to refined shea butter that can be extracted by machines. 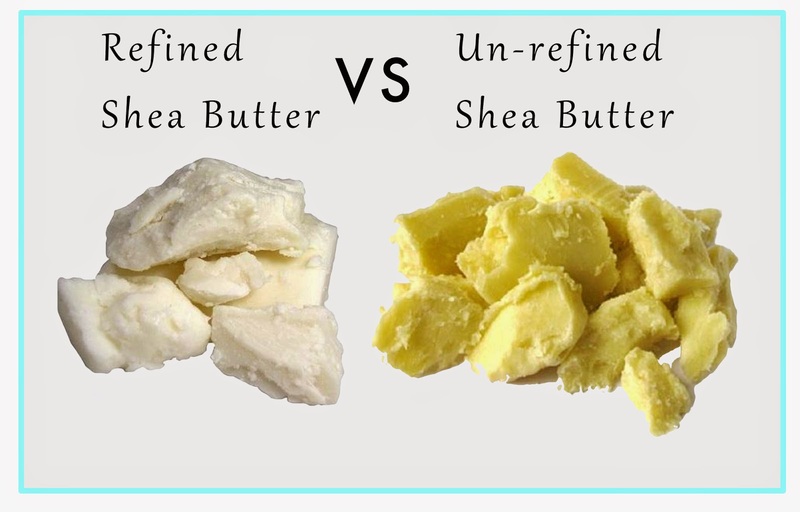 Also sometimes due to the additives added to the refined she butter, the end product for refined shea butter has got 'lesser' butter than the unrefined shea butter so this could also effect the final cost. Both the shea butter are usually used in moisturisers, hair care products and lip balm. Unrefined shea butter have got an added benefit because of its pure form, its good for problematic skin conditions such as rashes, dry skin, diaper rash, stretch marks etc. It also contains natural essential vitamins that is good for skin care. So which to use when? Basically if you are making a product for mass market, use the refined shea butter because of its smoother texture and lack of smell. If you are doing for yourself, friends and family, get the unrefined shea butter because of its added nutrients. To view Shea Butter sold in Soap Lab please click here. I would like to purchase the unrefined shea butter but I couldn't find it in this blog. Is it sold out? You mentioned that unrefined shea butterhas a stronger smell. Does that mean that even with the FO additive, the earthy/nutty smell is still strong? Thanks for your feedback. Hi nisha. What is the shelve life of the butter?